I found these Hershey mint truffle kisses during the Christmas holidays and purchased a few bags with St. Patrick’s day in mind. The inspiration for the cookie dough comes from the Turtle Thumbprints recipe. 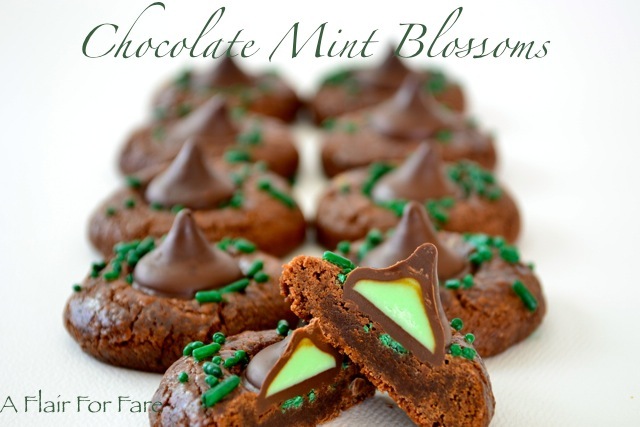 I knew it would be perfect for a chocolate blossom cookie, and would work with any flavor Hershey Kiss. The mint truffle, of course, is a great choice for our favorite green holiday. Unwrap kisses and refrigerate until ready to add to cookies. 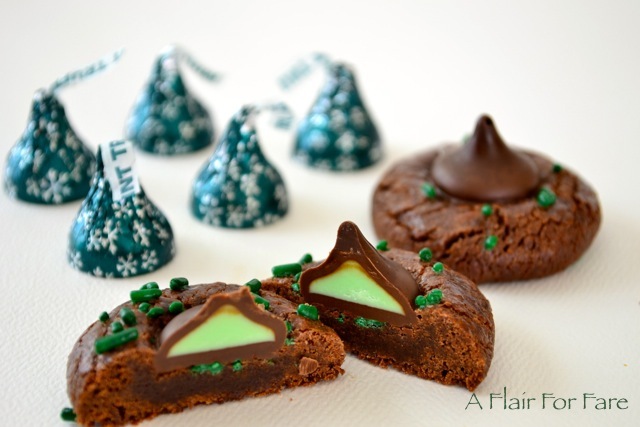 You can use regular dark or milk chocolate kisses if you cannot find the mint truffle. The cookie will still have a mint flavor from the peppermint extract. Sift flour, cocoa and salt into a large bowl; set aside. Using a heavy duty mixer, cream butter and sugar. Add egg yolks one at a time; mix in milk, peppermint and vanilla extracts. Slowly add flour/cocoa in four parts, mixing just until combined. Chill at least one hour. Dough can be made in advance and chilled for several days. You will need to bring it back to room temperature (4-5 hours) so that it is soft enough to work with. Prepare baking pans. Line with silpat or parchment paper. Preheat the oven to 350 degrees. If cookie dough has warmed, refrigerate cookies on cookie sheet for 10 minutes to firm up then bake for 12 minutes, just until set. Remove from oven, wait 2 minutes, then gently push mint kisses into the center. Carefully move to a wire rack and leave undisturbed for a couple of hours until kisses firm up. The kisses will collapse if shaken before cooled.